Deutsche Windtechnik vaihtoi tuulivoimapuiston tavanomaiset Ethernet-kytkimet ja sarjapalvelimet Perlen teollisuustason Ethernet-kytkimiin ja sarjapalvelimiin. The technology within a modern wind turbine is a far cry from the humble Windmill of yesteryear. Encompassing accelerometers, humidity and airflow sensors, rotary encoders and signal processors, to name a few, the technology is complex and constantly evolving. Wind turbines and wind parks are generally located in remote places, where the wind power can be harvested without physical interruptions such as buildings. This poses challenges for technicians who need to monitor the functionality of the turbines and be notified when faults occur. A windfarm near Bremen in Germany, consisting of 7 wind turbines was experiencing problems with their existing fault notification system. The turbines are in a closed TAN (Turbine Area Network), connected to one another over multimode fiber and feed their status notifications to a master turbine. Each Wind turbine contains a controller unit for monitoring purposes which sends out fault notifications should the turbine be compromised. 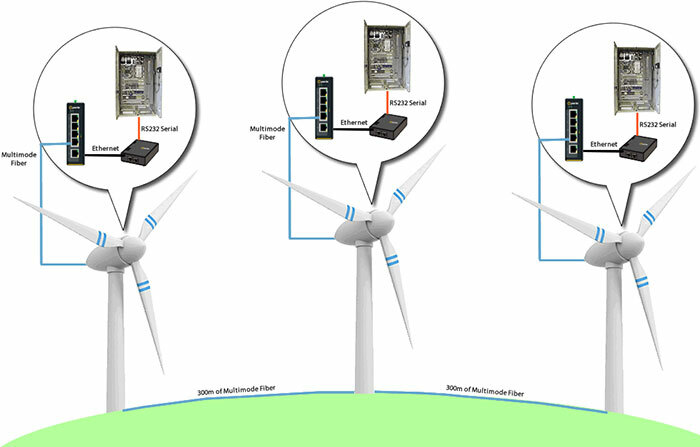 The turbine controller’s serial interface connects to Ethernet via a Serial Device Server and integrates into the multimode fiber network using Ethernet Switches. The fault notification system proved to be unreliable, and the Windfarm owners turned to Deutsche Windtechnik (DWT) for advice. Andreas Körner, SCADA-Administrator at DWT, identified that the temperature fluctuations within the wind turbine was the likely reason for the malfunction. The windfarm was using commercial grade Device Servers and Switches to monitor the status of the turbine. Product failures become inevitable when “commercial-grade” parts are exposed to extremely high or low temperatures. For example, integrated circuits on PCBs overheat causing premature failure of the product. Under-rated connectors do not allow for proper contact between the device and the cables. These failures eventually stop all data communications in these high and low temperature environments. DWT needed to source equipment that could reliably support extended temperature capabilities. Having worked with Perle on a previous project, Körner got in touch to source replacement equipment with industrial grade components and certifications. By replacing the commercial grade equipment with extended temperature equipment from Perle, the system was seamlessly upgraded. The turbine controller now uses Perle IOLAN SDS Device Servers, which are integrated into the TAN using IDS-108F Industrial Ethernet Switches. Deutsche Windtechnik is a specialist in the maintenance and repair of wind turbines on land and offshore. The day-to-day business includes the planning and implementation of maintenance, repair, upgrading and inspection procedures. All measures to keep the fascinating wind turbines up and running for the long term. What makes us stand out from other service companies? We offer everything from A to Z – and match that with a passion for all technical services related to wind power. 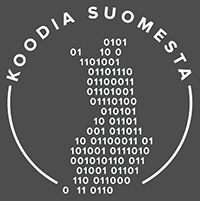 Kanadalainen Perle Systems kehittää ja valmistaa korkealaatuisia, tietoturvallisia ja runsailla ominaisuuksilla varustettuja tuotteita automaatio- ja tietoliikennesovelluksiin kuten päätepalvelimia, sarjalaitepalvelimia, I/O-laitepalvelimia, mediamuuntimia, teollisuus Ethernet-kytkimiä, Ethernet Extender -pidentimiä ja datakeskusten konsolipalvelimia sekä etävirranhallintalaitteita. 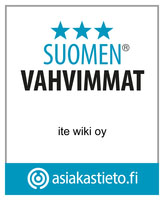 Perle Systems antaa suurimmalle osalle tuotteistaan elinikäisen takuun.